Nick: Funnily enough, the mix begins with Shackleton’s “Naked”, a track that Paul had actually cut on dubplate. The fact that he then fed this eminently mixable platter into a digital multitrack has a strangely perverse logic about it. Well, whatever your opinions on that, its results that count, and I for one was really impressed with the way Paul mixed and edited it all together. Although there’s evidence of digital trickery, the overall effect is of a natural, flowing mixscape. Funnily enough, the mix begins with Shakleton’s “Naked”, a track that Paul had actually cut on dubplate. The fact that he then fed this eminently mixable platter into a digital multitrack has a strangely perverse logic about it. I enjoyed his mix so much, I told Paul he should get it online for the massif, and he has duly obliged. You’ll find the link near the end of this post. Whilst you’re waiting for it to download, here’s a few words in conversation with Mr. Autonomic…. Gutta: So what’s this new mix all in aid of then, Paul? Paul: I wanted to do something to celebrate the first anniversary of Riddim.ca, something different that built on the grime/dubstep digimix I did last year with Ableton Live. There are a lot of custom edits of familiar tunes, although I let some other big tracks like “Neverland” just ride – you don’t need to do anything with that track but listen. There are some unreleased bits too. Gutta: So I notice. How’d you get hip to Headhunter and Wedge so quickly? Paul: I was lucky enough to get an e-mail from them with a few tracks in it a couple of months back. I wasn’t too happy with the intro I’d done for the mix and those tunes gave it an entirely new life. Those guys are amazing. Same with Laurie (Appleblim) and Sam (Shackleton). They’ve been good to me. Gutta: Yeah, sharpen those decks skills, Paul! I dunno how, or when, but one day you and me are gonna go back-2-back! Paul: Yes, you and I back-2-back would be wicked. Funny thing, you got me thinking about getting a CD deck again today with that photo on your blog. Nice one. I’m keeping my fingers crossed to get back over to the UK in the next year or so and get outside of London too, so I’d definitely like to meet up if possible. I’d love to hit a Subloaded. 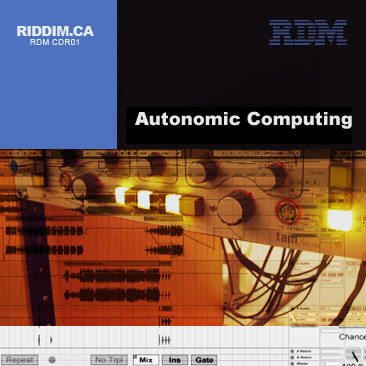 Gutta: So apart from displaying the finer points of digitally-constructed mixing, what else do you hope to achieve with “Autonomic Computing”? Paul: I’m hoping to use the mix locally as a way of promoting the music, whether on CD-R, radio, etc. I know interest is really growing right now, so the mix is meant to give a sense of what’s gone on in the last year or so, plus some tastes of what’s to come. There’s also a bit of nostalgia in it for me, like when “28g” mixes into “Request Line” – that’s my ‘memories of FWD>>’ moment. Gutta: That’s right, you managed to reach a FWD>> night last year, didn’t you? Paul: Yeah, I got a chance to go last June, a few hours after getting off the plane. I was actually being introduced to Skream when “Request Line” dropped. And “28g” taught me what it means to breathe the bass. This entry was posted on Thursday, March 23rd, 2006 at 10:45 am	and is filed under Mixes/Audio, Riddim.ca. You can follow any responses to this entry through the RSS 2.0 feed. Both comments and pings are currently closed.